We're back! Vacation's over. We didn't have the weather one can expect in July, but we still enjoyed our two weeks in France. 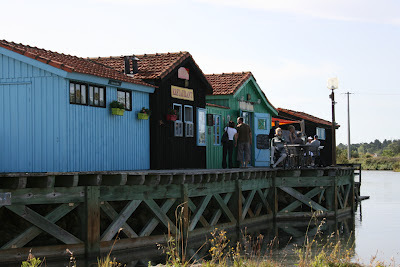 During our stay on the island of Oléron, off the Atlantic coast just opposite Marennes, France's oyster nest, we discovered a wonderful little restaurant, located on a wooden pier in a place called Le Port des Salines, outside the town of Grand-Village-Plage (see below). The place seems to be packed all the time, so here's a word of advice, book ahead if you want to seat outside. The menu is displayed on chalkboards throughout the restaurant, because the owner changes it three times a year, sometimes more, according to the availability of seafood and seasonal produce. And yes, it is mostly seafood you will be served there.